We have been serving the community of Lynnwood and Mill Creek area since 1998. As a husband and wife team our goal is to educate as many people as we can on the benefits of chiropractic care. We believe the spine and nervous system are the bodies core. The bodies ability to function properly can be effected by subluxations of the spine. As chiropractors in Lynnwood we work with you to set you up on a plan to achieve your goals whether that is just to get relieft from your pain to achieving optimum health. Through educational opportunities (like our website) and spinal care classes, we hope to communicate the value of ongoing chiropractic care to the members of the Lynnwood and Mill Creek community. Our desire for Lynnwood is to see our patients choose the emerging wellness model that includes preventative chiropractic care. Only you can make the choice to start living a wellness life style! Regardless of your health goals, please understand that we see ourselves as your coach. Your health is your choice! It’s your body, your health and your future. Our job is to offer you the finest chiropractic care possible in Lynnwood, and it’s up to you to decide how much of it you want. Sound interesting? 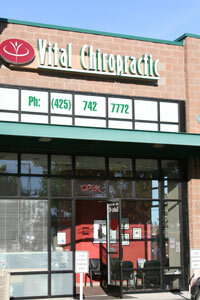 Please contact our Lynnwood office to make an appointment today.